Sensory details bring the past to life in this charming time-travel story. 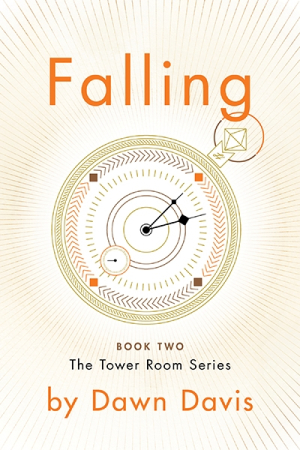 The second book in the Tower Room series, Dawn Davis’s Falling is an intriguing time-travel adventure. It’s 1988, and Leo is a lonely middle-aged baker who has a strained relationship with his daughter, Francine. She’s a high-strung lawyer who resents the limitations her pregnancy represents, especially after she is forced into a long-term hospital stay. Leo moves in to a large house that is owned by his recently discovered second cousin, Dilys. In a special tower room of the house, Dilys entertains occasional visitors. When Leo is invited up to tea, the brew sends the two into the midst of the War of 1812. Rescued by a pair of almost otherworldly twins, Hank and Lily, Leo has to learn how to live in the past. He takes interest in the differences between the two time periods, and adapts by doing what he does best: baking. This results in an engaging story line. Dilys is a seasoned time traveler, but she isn’t much help when it comes to integrating Leo’s two realities. Dilys’s character is mysterious throughout, lightly developed with only hints about her past and her travels. The nineteenth-century portions of the book are visceral and sensory. Sight, smells, sounds, tastes, and textures make the narrative experiential. This is in contrast to the contemporary sections, which are more observational. In contemporary times, Leo is someone who lets others, including his daughter, walk all over him without fighting back. In the past, his work to adapt puts him on a more interesting journey, and he becomes more sympathetic. He’s shown to be a person of depth who displays affection and respect for others, taking interest in those whom he meets and interacts with. Leo’s return to the present is wrenching for him. He’s changed by his experiences, and has to adjust yet again. His struggle results in good tension late in the book, foreshadowing another potential return, but without payoff. Dialogue helps to distinguish the time periods. Different dialects and speech patterns set the eras apart in a natural way. Because most of the book focuses on Leo, it’s disconcerting when the narrative head-hops into other characters. Pacing is gentle, resulting in an occasional lack of narrative drive. Tangential stories and backstories work best in the nineteenth-century section of the text, with information actively and helpfully given to Leo. Backstories in the contemporary section function more as information dumps. It is unclear how this book connects to the larger series, but it generates interest in learning more. Falling is a charming time-travel novel that will pique interest in its series, in which characters actively participate in the periods where they land.